NEW: U.S. condemns "barbaric attacks"
Islamabad, Pakistan (CNN) -- The death toll from a suicide attack in southwestern Pakistan has risen to 73, police said Saturday. 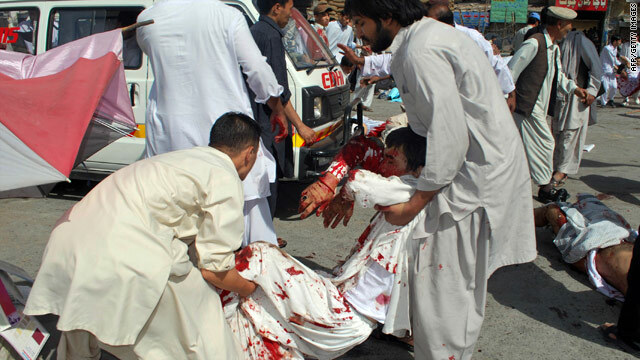 At least 206 people were wounded in the Friday attack that the Pakistani Taliban claimed responsibility for. Officials on Friday reported that 59 people were killed in the attack. Qari Hussain, a senior member of the group -- also known as Tehrik-e-Taliban Pakistan, or TTP -- said the attack avenged the deaths of Sunni religious leaders by Shiites. The TTP also claimed responsibility this week for a trio of suicide attacks Wednesday during Shiite processions in Lahore, which killed 31 people. The blast in the city of Quetta occurred during an Al Quds day rally, an annual event in the Arab and Muslim world that criticizes Israeli policies toward Palestinians. Dramatic television images showed what appeared to be the blast, followed by heavy gunfire and people dispersing. Images also showed many casualties being treated. The U.S. Justice Department announced this week that a key TTP leader, Hakimullah Mehsud, has been charged for his alleged involvement in the killings of seven U.S. citizens at an American military base in Afghanistan in 2009 and the attempted Times Square bombing this year. A $5 million reward is being offered for information leading to the capture of Mehsud and another top Pakistani Taliban leader, Wali Ur Rehman, U.S. officials said. Hussain said his group felt proud that the United States felt "threatened" by the Taliban. "We will continue to attempt the kind of attacks we tried in New York Times Square, but next time, we will succeed," he said. "Soon the world will realize that we are very effective." State Department spokesman P.J. Crowley said U.S. officials "strongly condemn the recent barbaric attacks on religious processions in Lahore and Quetta and on a place of worship in Mardan, near Peshawar. Our sympathies are with the victims and their families and all those affected by these cruel acts of hatred. We stand with all of the people of Pakistan who should have the freedom to peacefully observe their religion, especially during Ramadan, and focus on rebuilding their lives after the floods, not mourn friends and family killed in terrorist attacks." In an apparently unrelated incident Friday in northwestern Pakistan, a suicide bomber blew himself up outside an Ahmadi worship place in Mardan, killing himself and a pedestrian, police said. The incident occurred in Khyber Pakhtunkhwa province. Waqif Khan, Mardan's police chief, said guards fired on the suicide bomber when he tried to breach the site's security barrier. After he was injured, the attacker detonated his explosives. Four other people were injured in the attack. Ahmadis, who call themselves Muslims, are considered heretical and have been persecuted in the Muslim world. Recently, there was fighting between Ahmadis and non-Ahmadi Muslims in Indonesia. Sunnis and Shiites do not consider the Ahmadis part of Islam because they do not regard Mohammed as the last prophet sent by God. As such, they have been targeted by Islamic extremists. Pakistan's population is largely Sunni Muslim.